'igh famblies long enough to know a lady when he see one, an' if that was a lady he was no judge o' females." " The one at the Lodge," added Thomas loftily, "'Merican or no 'Merican, she 's one o' the right sort, as any gentleman 'u'd rec-kinize with 'alf a heve. I remarked it myself to Henery when fust we called there." The woman drove away; the look on her handsome, common face half frightened, half fierce. 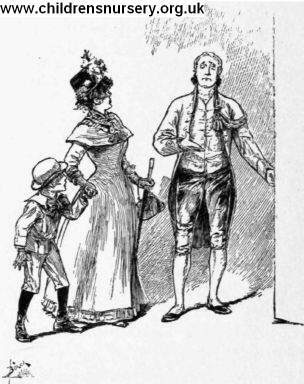 SHE WAS TOLD BY THE FOOTMAN AT THE DOOR THAT THE EARL WOULD NOT SEE HER. a passionate temper, and a coarse, insolent manner, she was neither so clever nor so bold as she meant to be; she seemed sometimes to be almost overwhelmed by the position in which she had placed herself. It was as if she had not expected to meet with such opposition.